I am not a numbers guy, but sometimes numbers in the news are so staggering that even I am forced to sit up and take notice. These numbers cause my eyeballs to bulge and my brain to redline. For example, I have heard some people say about education: “If it was good enough for me, it's good enough for the kids today.” I came across some staggering numbers that make statements like this uninformed (to be polite). A knowledge tsunami is bearing down on us. 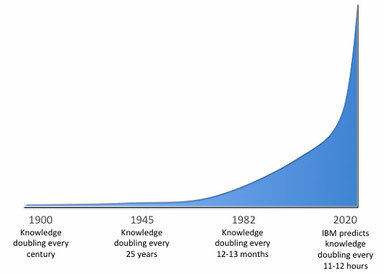 According to an IBM analysis, by 2020 knowledge will likely be doubling every 11 to 12 hours. That's the sum total of all human knowledge – everything humans know – doubling twice a day! This doubling has been happening throughout history, but never at this rate. “Knowledge doubled from 100 B.C. to 1700 (1800 years). It doubled from 1700-1900 (200 years). It doubled from 1900-1950 (50 years). It doubled from 1950-1970 (20 years). It doubled from 1970-1980 (10 years). It doubled from 1980-1988 (8 years). It now doubles every 12 months. Soon it will double every 12 hours.” This is known as the knowledge-doubling curve and the concept was introduced by Buckminster Fuller in 1982. The reason behind this Chinese operation? “As China becomes increasingly wealthy and assertive it is outsourcing a dirty industry to the United States so they don't have to bear its pollution." Welcome to the third-world United States of America. It will probably not surprise you to learn that the most expensive city in which to park is New York City, about $28 for two hours of off-street parking. Per month, parking costs vary from city to city: New York - $493, Boston - $330, San Francisco - $303, Washington - $254, Chicago - $227, Detroit - $143, and Atlanta $68. For New Yorkers that represents around 46 percent of the cost of operating a vehicle. If all of these are a bit staggering, you could send for help by putting a message in a bottle and tossing it in the ocean. Then again, someone did this in 1886 and it was just recently retrieved. (http://www.newser.com/story/256218/on-aussie-beach-the-worlds-oldest-message-in-a-bottle.html). “That would make this the oldest message in a bottle at 132 years old.” Of course, with knowledge doubling twice a day by the time someone reads your message 132 years from now they might consider you a bit behind the curve.